Brush Dragons live in dark, heavy thickets that grow along woodland rivers. They are closely related to Water Lily Dragons and even look somewhat similar, but their temperament is totally different â€” they're shy and timid. They like morning mists, lilac bushes, and willows that lean over the water. How to Breed Brush Dragon? 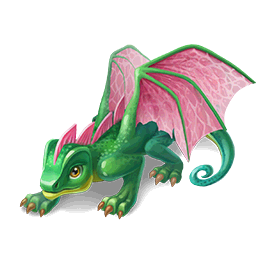 Find out how to breed Brush dragon with the How to Breed Calculator!